Penn is using Smore newsletters to spread the word online. This week students in Mrs. Thoensen's first grade class got the amazing opportunity to watch a monarch emerge from its chrysilis. Amazing. The whole school learned safe procedures in case of a fire during our first fire drill of the year this morning. Teachers continued to work on developing our commitment statement and planning for innovative instruction. Parents we want you to learn some new things at our upcoming Penn Panther Academy! Why: We want to help YOU help your kids’ learning. Is homework a struggle? What’s with the new math? Click here for the full schedule. Like years past, Penn Elementary uses the PBIS (Positive Behavior Interventions and Supports) framework to teach, model, and recognize positive behavior and social skills. We expect students to be caring, respectful, responsible, and ready. Especially at the beginning of the year, we talk about the importance of these behaviors and give students lots of practice showing us what it means to be respectful in the classroom, caring on the playground, or responsible in the cafeteria. It is important to do this so that kids can feel they are in a positive, safe, and consistent learning environment. You can help reinforce these positive behaviors by asking your child at home, what does it mean to be respectful during class and how did you show that today? As a reminder, when teachers and staff see these kids showing these Penn traits, they will recognize them with a positive comment and your child may even receive a Penn Paw. Be sure to ask them about Penn Paws! We kicked off our 2016-17 school year with an all school assembly and Mrs. Heffner talked about Penn Pride (Expect Success), Mrs. Zacek reminded us about nominations for the Big Burrito and Mrs. Clemence led us in our Penn Panther Roar. Maybe your Panther has “roared” for you at home. 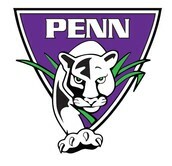 Proud Penn Panthers and we’re ready to roar. Spreading our pride throughout Penn and more. Caring, respectful, responsible and ready. C! R! R! R! ROAR! DINE OUT on September 22 to support schools in the Iowa City Community School District! Fun Night at Penn is Friday, October 14th. Fun Night is an important fundraiser in our effort to supply materials and other special opportunities for our students throughout the year. The night is filled with fun things to do for every age. We'll have games, dinner, raffles, a silent auction, etc. Bring your whole family and enjoy! We need your help in making Fun Night run smoothly as well as making our biggest fundraiser a great time for families and friends. Volunteer to work a shift at Fun Night - We are once again using SignUp Genius to schedule volunteers. We will send the link in the next few days for you to sign up. We need over 100 volunteers so PLEASE consider giving some of your time! Your child can help you with this too. If you have, or know of, junior high or high school students who would like to help, we'd love their help as well. Donate a baked good for the Bake Walk - One of our most popular games at Fun Night for both kids and adults is the Bake Walk where winners take home cakes or other baked goods. Everyone loves to see the tables filled with such fun and yummy treats. Some years we are a little short on items so if you're willing to bake or purchase a cake, cupcakes, etc. (nut free please), we'd really appreciate it. More information to come later on when and where to donate your baked goods. Donate new small items for the grab bags and Bingo prizes - We are always looking for small toys to put in grab bags or give as Bingo prizes. Suggestions include new Happy Meal toys, dollar bin items, books, stickers, pencils, erasers, new stuffed animals or other small toys. Please drop off your donations at the school office by Friday, October 7th. Donate an item for the Raffle/Silent Auction - If you, or your business, have something to donate as a raffle or silent auction item please bring it to the school office at any time or email Katie Cronk(katiecronk@gmail.com), preferably by Wednesday, October 5th to ensure your name is included in the silent auction listing. Thank you for ALL your help with this important fundraiser!! The Penn PTO invites you to a free movie night on the Penn playground. Bring chairs, blankets, drinks and extra snacks. Small servings of popcorn will be offered. Sept. 27 - Fall Pictures! Order forms will be sent home when it's closer to the date. Sept. 29 - Panther Academy, 5:30-7 pm -- plan now to attend with your children for a fun evening of learning!